Crowne Plaza Charlotte Hotel welcomes pets under 50 pounds. A $50.00 per stay non refundable service fee is charged for each pet. Pet fee should be refundable if no damage. Fairfield Inn & Suites by Marriott Charlotte Uptown in Charlotte city centre is 9.6 km from Charlotte Douglas International Airport. It offers on-site dining, a free hot breakfast, and rooms with free WiFi. Fairfield Inn & Suites by Marriott Charlotte Uptown features contemporary rooms with a flat-screen cable TV. There is a comfortable seating area and desk. Rooms with balconies are available. 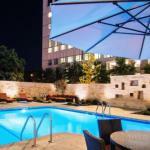 During their stay, guests can swim in the outdoor pool or workout in the 24-hour fitness centre. The Carolina Panthers football team is within 2 km of Fairfield Inn & Suites by Marriott Charlotte Uptown. Charlotte Motor Speedway is just 23 minutes' drive away..
We plan to add more related stuff like: pet friendly hotels in Charlotte, North Carolina dog friendly hotels in Charlotte, dog parks in Charlotte, pet stores in Charlotte, NC, and pet spas in Charlotte. Keep checking for more!